1. The full and total inspiration of all Scriptures. 2. The tri-unity of God: Father, Son, and Holy Spirit. 3. The virgin birth of Jesus Christ. 5. The redemptive work of Christ: His atoning blood; His death; His burial; and His bodily ressurection. 6. The second coming of Christ: The pre-tribulation rapture of the saints and the pre-millennial return of Christ. 7. The eternal security of the believer. 8. The commission of the local church to make disciples for Christ--by evangelization, baptism, and education. 9. The responsibility of the local church to edify, comfort, and encourage those of its own household of faith. 10. The responsibility of the local church to promote and protect the doctrinal and moral purity of the Body of Christ. 5. Believe by faith that Jesus Christ did save you as He promised in His Word. (Romans 10:13; John 3:16; I John 5:13). It has been some time since our last issue and we would like to apologize for that. We are going to try to get a smaller version of the chronicle out every month and an expanded edition every third month. Please submit your articles, answered prayers, poems, or anything that the Lord puts upon you to us whenever you can, they will always be put in and I am sure will be a blessing to all. Praise the Lord for His faithfulness to us this summer. I can remember one special Wednesday when Alex and Caroline Jiminey came to see me. Caroline was ready that day to trust in Jesus for the forgiveness of her sins. After that they were both eager to follow the Lord in the water of baptism. They were baptized on Sunday Morning July 11 and I look forward to their continued growth. I also have fond memories of Vacation Bible School. I praise the Lord for the faithfulness of John Romero and all the precious saints who donated their time to reach boys and girls with the good news about Jesus. One girl, named Amanda committed her life to Jesus Christ along with some other children. The Lord also used that week to bring Lyndon Douglous to Himself. Bob Tanner and I spent about an hour with Lyndon clarifying the gospel on one VBS morning and Lyndon responded with a sincere prayer for Jesus to forgive him and come into his life. I am thankful to announce that Lyndon has requested to be baptized Sept. 12th, which happens to be the day after his birthday. Also a brand new Christian family has come to Calvary, who desire both baptism and membership. Don Man along with his wife Angell and two of their children would also like to be baptized on September 12. We praise the Lord for these new people who desire to grow in their relationship with the Lord. I praise the Lord for the Calvary Baptist Church family. Some newcomers have told me that they were attracted to Calvary because of the love of Christ that they have experienced. Let us continue to exalt our Lord Jesus Christ and increase in our love for one another. The Lord is going to accomplish many wonderful things this fall. Remember that "His word does not return void (Isa. 55:11)." I believe He will bless our desire to broadcast the gospel of Jesus Christ. Please pray for the upcoming AWANA ministry and the continued strength of our youth ministry. Pray for me as I preach on the glory of God in this church from Paul's splendid letter to the Ephesians. Together may we continue to strive together for the faith of the gospel (Phil 1:27) and "let us not grow weary while doing good, for we shall reap if we do not lose Heart." Come, child, let us journey together. Where shall we go, Father? To a distant land, another kingdom. So the journey will be long? Yes, we must travel every day. When will we reach our destination? And who will accompany us? Must Sorrow travel with us? Yes, she is necessary to keep you close to Me. But I want only Joy. It s only with Sorrow that you will know true Joy. A willing heart to follow Me. What shall I do on the journey? Stay close to Me. Let nothing distract you. Always keep your eyes on Me. And what will I see? You will see My glory. You will know My heart. The Father stretched out His hand. The child, knowing the great love of her Father had for her, placed her hand in His and began her journey. How do you spend most of your days? Do you rush from one place to another just trying to make a deadline? Time has become a valuable commodity. But we never read in the Gospels where Jesus hurried anywhere. He was never irritated by delays or anxious over upcoming projects. He was focused and at peace. Life was not a hassle for the Son. Jesus had a purpose and a plan, and He was certain that the Father would accomplish both through Him. Those who understand this truth experience the greatest sense of peace. Many people spend a lifetime searching for the right thing to do with their time and talent. They pray and wait, and when the answer tarries, they become depressed. The goal God has set for our lives is this: To love Him and to serve Him above and beyond all else. You may be a carpenter, a mechanic, a stay-at-home mom, a doctor, or a lawyer. No matter the vocation, you can be in Gods service. Dont waste time worrying if you have made the correct choice. Ask the Lord to make His will your will and leave the details to Him. A willing heart is all He asks. If there needs to be a change in your life, He is able to do it. Take time to worship Him each day and learn to enjoy being in His presence. This is where you will find true hope and love. Please join us for our annual Church Picnic at Cathedral Pines on September the 11th. Please bring enough food for your family and maybe a little more. There are barbecues, picnic benches and a playground for the kids. There will also be devotion so bring along your Sword (bible). Its going to be a great day of fellowship. 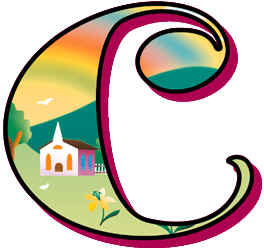 Starting September 10, 1999 here at Calvary Baptist Church will be the first night of a boys and girls Christian club. AWANA is an international, Bible-centered youth ministry providing local churches with weekly clubs and programs for three-year-olds through high schoolers. The goal of the club is to reach boys and girls, and their families, with the gospel of Christ and train them to serve Him. The following is a list of the different groups that make up the club. If you are interested in signing your child up or in helping please see either Bob Pettis or the club Secretary Lisa Leirer. Bob Pettis will be the commander and Pastor Chris will be overlooking the entire program. Our Missionary who has been training the teachers and assisting us in setting up the club is Ken Hoffmeyer. This man is truly a blessing to all of us who have met with him. Please keep him in prayer. We have designed a Home Page for the internet. We plan on putting a bunch of stuff into it, including music, bible studies, our newsletter and much more. Please pray for us that the Lord will continue to keep the fire burning in our hearts as we take on more to serve Him. Our web site could be looked at http//home.att..net/~calbapchurch/www.cbcom.html and remember this is just a home page and is not finished that is why it is not a WWW address. Calvary Baptist Church held its annual Vacation Bible School from August 2nd through the 6th. Approximately 70 students were divided into five age group classes, from 3 years of age to 8th grade. The theme of the week was the different names of Jesus. The central purpose of the week was to present the gospel to the students; presenting the only way of salvation to those who have not become Christians, and seeking to strengthen the faith of those who are christians. Students had a week of fun, participating in game activities in P.E. class, learning new songs in Music class, and creating beautiful projects in Arts and Crafts class. The importance of being a good stewart of our possessions was also stressed. Each day a collection was taken for our AWANA missionary, Mr. Ken Hoffmeyer. The students were taught the importance of reaching out to others with the gospel, and that our AWANA missionary was reaching out to other children with the gospel. A total of $167.32 was collected towards this purpose. On behalf of Calvary Baptist Church, I would like to thank all of the teachers, assistants, and others who sacrificially gave of their time and effort--without YOU we could not have had a Vacation Bible School. Your reward is truly "in Heaven"! On Sunday August 15th Calvary Baptist Church received some very special visitors. It was our pleasure to have, John, Marion, and Sharon Tibberts with us in the morning service. John gave a report of his efforts from Canada, and offered to us words of encouragement. Sharon, along with her ministry partner, Viviana, gave us a report from the mission field, working with Tribes in South America. Our dear missionary brother Gordon Loop conducted the evening service. Gordon, along with his wife Beth Eden and children Mikayla and Justin, were on a two-week vacation. attention. He then shared with us from God's Word the importance of using our lives to reach others for Jesus Christ! Please remember our missionary friends in your prayers! down the aisle and up onto the pulpit he took off his hat and coat. My heart sank. There stood our preacher...he was the "homeless man." No one said a word. The preacher took his Bible and laid it on the stand. "Folks, I don't think I have to tell you what I am preaching about today." Then he started singing the words to this song. "If I can help somebody as I pass along. If I can cheer somebody with a word or song. If I can show somebody that he's traveling wrong. Then my living shall not be in vain." "IS YOUR LIVING IN VAIN?"